It is a customized and advanced version of a LineChart where series are filled. It is used to represent statistical data graphically. The <p:chart> is a generic component to create chart in JSF application. We can set type of chart to specify the type pf chart. The chart has various attributes that are tabled below. These attributes are generic and applicable for all type of charts. rendered true Boolean It takes boolean value to specify the rendering of the component. type null String It is used to specify type of the chart. model null ChartModel It is used to set model object of data and settings. style null String It is used to set inline style of the component. 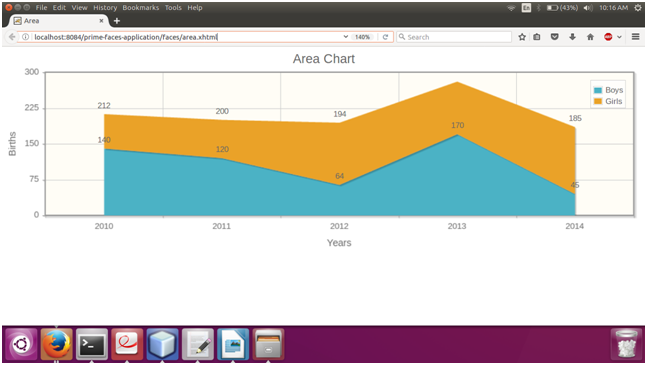 responsive false Boolean In responsive mode, chart is redrawn when window is resized. Here, in the following example, we are implementing <p:chart> component. This example contains the following files.